Emergency: An earthquake measuring 8.4 on the Richter scale struck southern Alaska. Airlifted: 1,850 tons of electrical generators, water purification equipment, seismographic apparatus, construction equipment, bedding, and clothing; and 850 passengers, including medical, construction, and communications personnel. 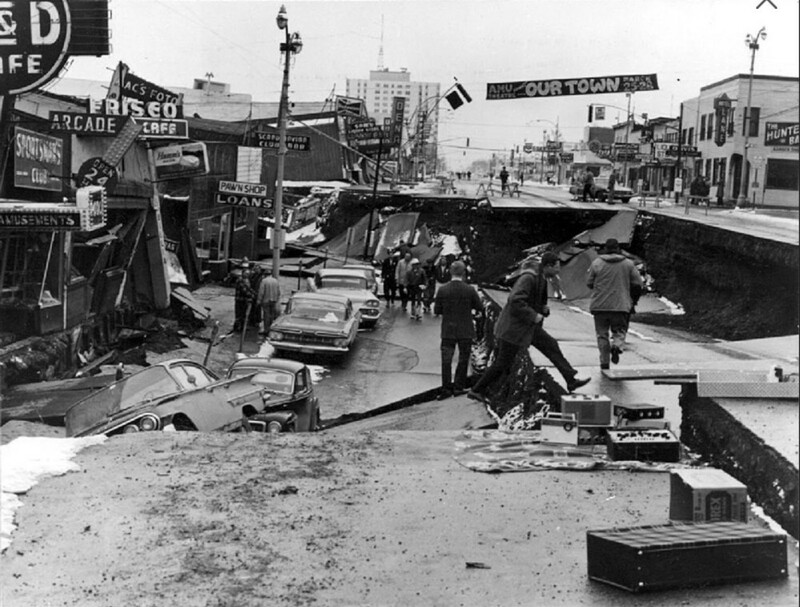 At 5:36 p.m. on Good Friday, March 27, 1964, the 20th century’s most intensive earthquake to hit North America struck South Central Alaska leaving 131 dead and damages estimated between $400 and $500 million. Registering 9.2 on the Richter Scale the quake produced a seismic sea wave (tsunami) felt as far away as Japan, Hawaii, and California. 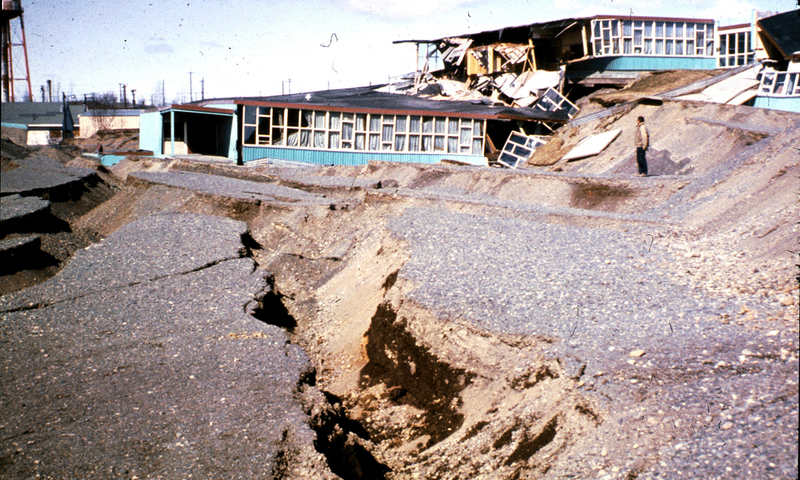 The initial earthquake and a long series of aftershocks left Anchorage in ruins and destroyed large sections of Seward, Valdez, Whittier, Cordova, Kodiak, and Kenai. Following the governor’s emergency proclamation, President Lyndon B. Johnson declared Alaska a major disaster area. Within hours of the first tremor, the U.S. military launched Operation Helping Hand, a joint military and civilian effort unparalleled in Alaskan if not in our nation’s history. As fast as communications were reestablished between the military installations, Civil Defense Headquarters, and the devastated communities of South Central Alaska, calls began pouring into the Command Post of the Alaskan Command. Immediately the Alaskan Air Command alerted the Air Force Logistic Command requesting that they respond to the supply requirements without delay. In turn the Military Air Transport Service (MATS) was notified, and transport aircraft located throughout the United States were alerted to airlift emergency supplies to Alaska. Twelve types of aircraft participated in the airlift including C-124 Globemasters, C-133 Cargomasters, C-97 Stratofreighters, C-123 Providers, C-135 Stratolifters, and C-119 Flying Boxcars operating from terminals as near as McChord AFB, Washington, and as far away as Dover AFB, Delaware. Most of the cargo was discharged at Elmendorf AFB outside of Anchorage or at Eielson AFB near Fairbanks; however, several missions proceeded to bases in the Aleutian Islands. Under the direction of the Alaskan Command, all the forces teamed up to complete many jobs. Military airlift arrived with vital cargo ranging from field kitchens and food for the hungry, purification units to provide potable water, toys for displaced children, and gifts from throughout the United States. Perhaps the most outstanding single operation of the airlift was a combined MATS-Alaskan Air Command-Alaska National Guard mission that involved the airlift of a 520,000-pound Bailey Bridge (a pre-engineered and built-on-site bridge with ready-to-assemble pre-fabricated components) from Elmendorf to the Soldotna-Kenai area on the Kenai Peninsula. The army engineers, having trucked the bridge in sections from Anchorage to Elmendorf, loaded it onto a MATS C-124, several Alaskan Air Command C-123s, and two C-119s. Sixty sorties, over a period of five days, were required to move the bridge. The bridge’s largest single payload of 45,630 pounds was airlifted by a C-124. During the operation’s 21-day duration, over 3,706,006 pounds of cargo were airlifted. MATS broke its disaster relief record by moving more than 2,750,000 pounds of supplies and accumulated more than 1,300 flying hours. By the end of April, Anchorage and the other devastated communities had begun to recover and required limited assistance. On Easter Sunday, Dover AFB launched its first two C-124 missions in support of Operation Helping Hand. More Dover missions would follow over the airlift’s 21-day duration. Our crew departed Dover on April 15th and proceeded to McGuire AFB to on load vans and electric generators. From McGuire, with several stops en-route, our destination was McChord AFB, Washington. Following our crew rest we flew on to Elmendorf AFB. Considering the considerable damage to the structures nearby, the landing and taxi in at Elmendorf were uneventful as the runway sustained little or no damage. The tower was a total loss, and a mobile unit was being used for air traffic control. Hangar walls were cracked, warehouses were buckled with their roofs collapsed, and the eight-story USAF hospital had received considerable damage. In this March 1964 photo released by the U.S. Geological Survey, the Government Hill Elementary School is shown destroyed by a landslide following an earthquake in Anchorage, Alaska. Having had a few extra hours added to our crew rest, and before we were to proceed out the Aleutian Chain to the Naval Air Station at Adak and further on to Shemya Island, we had the chance to see the devastation first hand. I recall that Ship Creek, near the gate at Elmendorf, was teaming with salmon not oblivious to their disruptive surroundings. In Anchorage, homes, automobiles, movie theaters, and department stores disappeared into holes thirty or more feet deep. Literally, the bottom had dropped out of the city. Needless to say, it was an awesome sight to behold! Sources: US. Geological Survey; Haulman, Daniel., Humanitarian Airlift Operations; Alaskan Air Command Publication: Operation Helping Hand; The Bailey System; Heist, Harry, memoirs. My dad was in Operation Helping Hand in 1964 Alaska earthquake.